28-year-old Dr Shakira Choonara received the Research Excellence for Next Generation Researchers Award for her outstanding contribution in the field of Public Health. Shakira Choonara at the NRF Awards in Bloemfontein. The National Research Foundation (NRF) has acknowledged a young Wits researcher with the first Research Excellence for Next Generation Researchers award for her contribution to Public Health. 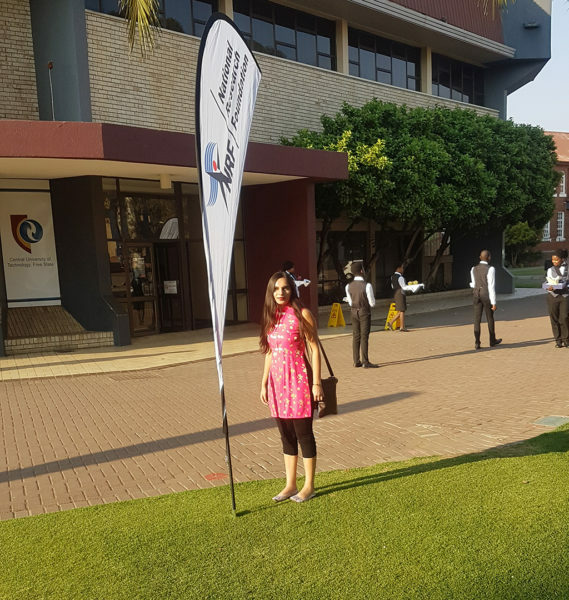 Shakira Choonara, who completed a Doctor of Philosophy from Wits in 2016, was awarded at the National Research Foundation (NRF) Awards which were held in Bloemfontein on Thursday, September 14. Choonara is a young leader who is a regional sexual and reproductive health rights advocacy officer and an activist for public health. The 28 -year-old researcher has been fortunate enough to receive funding from numerous sources such as the Postgraduate Merit Award and the Hewlett Foundation Fellowship. “I found at the postgraduate level there was much more funding available in terms of scholarships and financial support which does take a substantial burden off for many students compared to the undergraduate level where one is liable for student loans,” she said. “The reality is that either bursaries or scholarships are advertised quite late and they are long, tedious application processes or the majority of students remain unaware of these opportunities. I found that information from the financial aid office was either outdated or difficult to grasp and I would rely either on previous student experiences or learn the processes as one goes along,” Choonara said. The Business Intelligence Manager for the NRF, Gerhard Moolman, said it had funded 151 young women under the age of 30 through research funds and doctoral scholarships in 2016. The NRF also allocates 55 percent of its scholarships for grants to female applicants. Moolman also said a challenge with funding postgraduates is the low progression rate from honours to masters, particularly with female postgraduates. Choonara said there need to be more promising trajectories for young researchers to be leading academics. “What’s the point of pursuing studies until the doctoral or postdoctoral level but there are few employment prospects within the university. These are questions around university bureaucracy and faring better to reach and assist students,” she said.